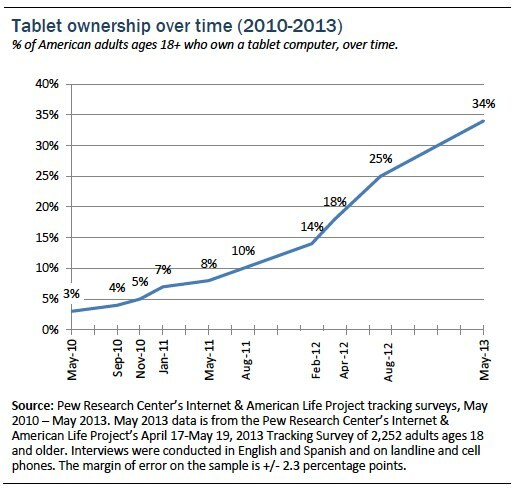 The following chart shows the increase in general tablet ownership over time, beginning with May 2010 when just 3% of adults said they owned a tablet computer. Unlike smartphones, which are most popular with younger adults ages 18-34, we see the highest rates of tablet ownership among adults in their late thirties and early forties. 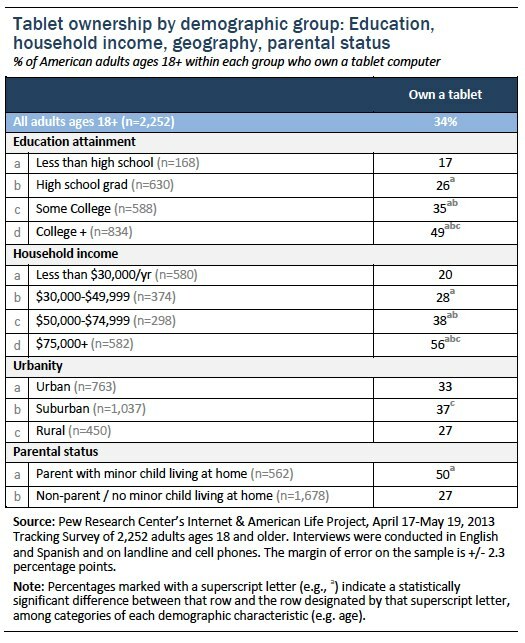 In fact, almost half (49%) of adults ages 35-44 now own a tablet computer, significantly more than any other age group. Adults ages 65 and older, on the other hand, are less likely to own a tablet (18%) than younger age groups. There are no statistically significant differences in tablet ownership between men and women, or between members of different racial or ethnic groups. Along with age, another pattern in tablet adoption is the strong correlation with educational attainment and household income. For instance, 49% of adults with at least a college degree own a tablet, significantly more than those at any other education level (including 17% of those who did not graduate high school). And a majority (56%) of adults living in households making at least $75,000 per year say they have a tablet computer, compared with 38% of those in the next highest income bracket and 20% of those making less than $30,000 per year. Additionally, adults living in suburban areas (37%) are significantly more likely than those living in rural areas (27%) to own a tablet. And parents are also more likely than non-parents to own a tablet: Half (50%) of parents with minor children living at home own a tablet computer, compared with 27% of non-parents. Among parents with minor children living at home, tablet ownership rose from 26% in April 2012 to 50% in May 2013 (an increase of 24 percentage points). Tablet ownership among adults living in households making at least $75,000 per year rose from 34% to 56% (22 percentage points). Tablet ownership among college graduates rose from 28% to 49% (21 percentage points). Meanwhile, other groups continue to show lower adoption levels. For instance, among adults who did not complete high school, 17% own a tablet computer, compared with 11% in 2012 (an increase of six percentage points, a statistically insignificant difference). 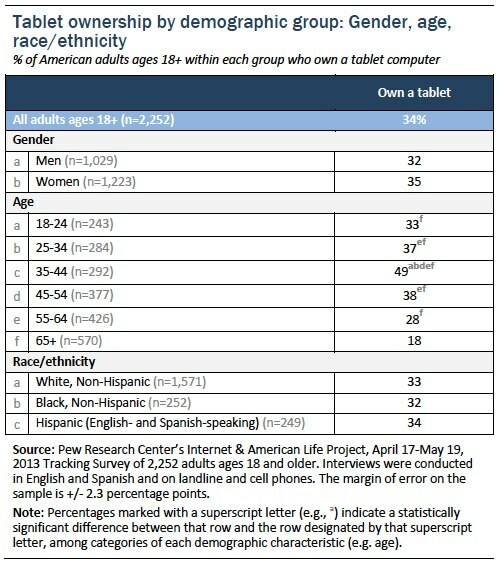 And while younger adults ages 18-29 were equally as likely as those ages 30-49 to own a tablet computer in 2012, those in their thirties and forties are now significantly more likely than any other age group to own this device, as is shown in the following table.